There are 11 posts in this thread, and it has been viewed 11530 times. In 1993 Data East finally decided to start supporting the Neo Geo. They jumped right in with a spiritual successor to Joe and Mac: Caveman Ninja. 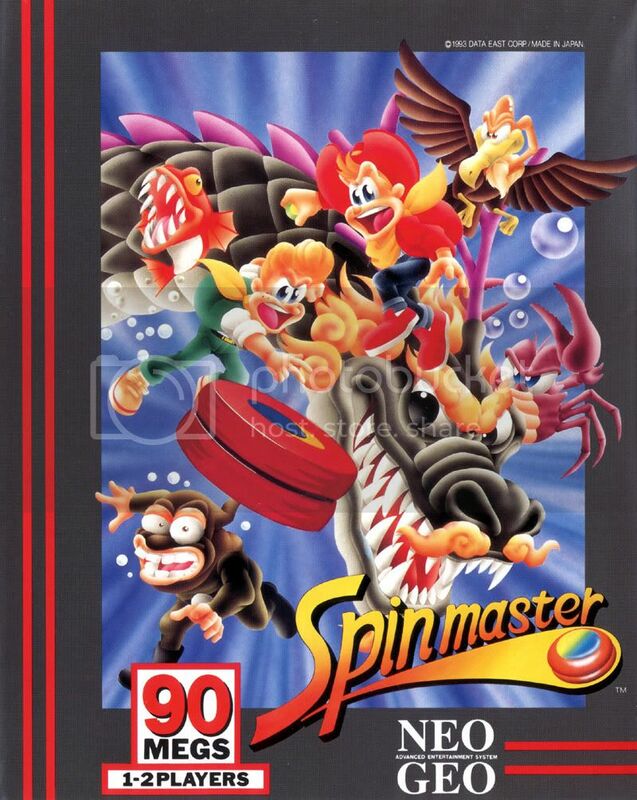 Spinmaster is a platforming action game by Data East. 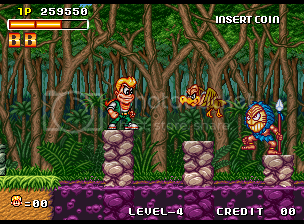 It features the same characters (albeit with different names) from the Genesis game Dashin' Desperadoes, and gameplay similar to Joe and Mac: Caveman Ninja. 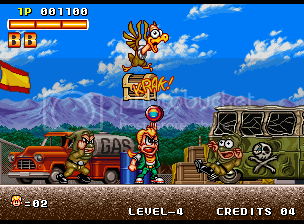 It is notable for being Data East's first Neo Geo game. No poll this time? However, this is a great little Neo Geo title worth a play or two. The gameplay is simple and recommended for 2 players, the graphics are just as colorful as a jar full of candies. What we've got here is another quality title from the Data East house, one of my favorite 3rd party developer for the Neo. 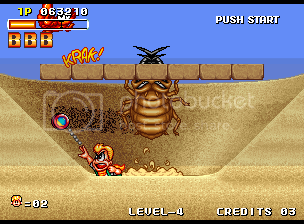 The only drop of bitterness is that Spinmasters / Miracle Adventure is quite short from what I remember, but eventually I won't argue as this still designed as a Arcade title and not a home console platformer like Super Mario World etc. I think it's a very suitable HSC game, so I'll participate as soon as I can find time. This game I suspect will be one of the least replied GOTW due to the fact that its a little obscure. Not sure if this is available on AES but it does sometimes turn up on MVS and is usually pricey. I have this on my multicart and found it a colourful and fun platformer ( just like Joe n Mack) cool little game, maybe the best platformer on NG technically. Data East made some great games to be honest back in the 80s/90s. I would like to own the cart at some point although I wont loose sleep if I never do. I really enjoy this game. It's really fun to play 2P. My nephew loves to play it, hence I play it often. The game IMO, looks fantastic. The sprites are huge and well animated, the color is vivid. The game really is gorgeous. In terms of gameplay, it's simple and the controls are crisp. I really like all the sound effects and little voice bits in the game, they add to the excitement. Like STE, I have it on multi-cart, but plan to buy it when I get a little extra cash. Another thing I really like about this game is that you can get a good or bad ending. I really like games that offer this feature, as it gives you a reason to re-visit the game if you screw it up. Probably my favorite platformer on the system. 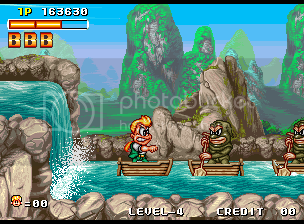 this is kind of a classic arcade title in terms of looks - big colourful sprites and vibrant busy backdrops. Everything you wanted in an arcade game back then. I've only ever played it in 2 player mode, when a friend came round and we thought it was the funniest thing ever. It just seemed very crazy and there we were these 2 oversized kids using our yo-yos to battle the enemies! really good fun. Not sure if i could play it like a serious game, but i imagine its fun for a while. There seemed like good variety between the stages and always lots going on, so yes pretty cool. I really like Data East's Miracle Adventure. Very appealing colourful graphics, a nice amount of variety between the different stages and the gameplay is fun. Somehow the game reminds me a little bit of Quackshot although the gameplay is different. It's a nice idea having both a good and a bad ending. My only criticism is that the game is a bit too short. It's disappointing that this never had a NGCD release. Spoiler Alert! 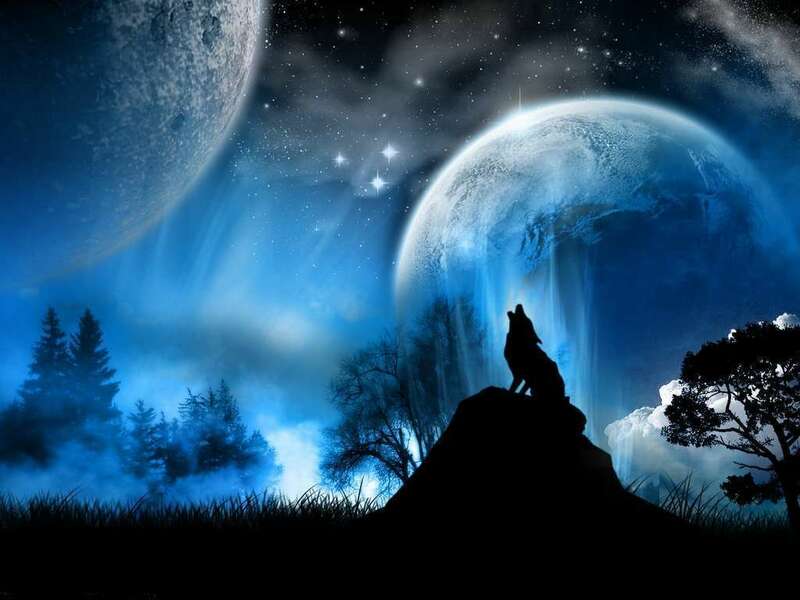 To See The Content, Just Click On The Image! Reelmojo please could you include a poll in future GOTWs. It's unlikely omitting the poll will mean more people post in these threads. I understand you had good intentions and were trying to get more discussion going. A personal favorite amongst my home carts but a tad too short, tailored to the arcade so I get that but I always thought this one could have been an absolute gem with a little more depth. Big reason I wish it had a sequel. There use to be a 2 slot at a pizza shop in my hometown that had Spinmaster and Aero Fighters 2, I don't even want to imagine the amount of quarters I piled into that thing through the years. I see I'm in the minority here, but I don't find this game enjoyable. That's not to say I find it unenjoyable either; it's sort of just there. The game is firmly lodged in the roots of mediocracy, and it's games like SM that caused the platformer-genre bubble to burst. I really like CN/J&M though, I just don't see that same charm here. I haven't tried Dashin' Desperadoes (GEN), the sister game of SM, but I want to playthrough it some time in the future. I put tons of money in the arcade machine when this first came out until I completed it and then I got the bad ending so did it again...it was lots of fun but must have cost me a small fortune. Well, I think this game quite enough captures what a platform game was back in the 90'. Althought the final bosses are not as ultra amazing and difficult as they could have been, and admiting the game is short for the ones on the genere, I personally love this game: there is a wide variety of places to visit, different enemies and they use yoyos as weapons! !